Stephanie of Dispensing Happiness is the hostess for this month’s Hay Hay its Donna Day and she picked this Polenta and Parmesan Chicken recipe. I have had this bookmarked for sometime, so I was excited that Stephanie picked something savory for us. I had all intentions of making this at the beginning of the week, when the spinach I had purchased was very fresh. By the time I got around to making it, it was Friday and we were in the middle of getting ready to head to Baltimore for a few days; the spinach had gone bad! Since the spinach was not good I used baby red butter lettuce with the fresh basil as well I added some vine ripe tomatoes we had laying around. I loved the breading of parmesan and polenta which we crusted some organic, cage-free chicken breasts with. I gently pan fried the breast in grape seed oil. Grape seed oil is great to use for frying or even quickly roasting chicken breasts, as it can handle high heat, which in turn gives the chicken a nice crispy crust and very moist flesh. We were commenting throughout the meal how plump and juicy these breasts were …. yum! Halfway through the cooking process, I had this feeling I was not going to like this dish, I am not sure why, just this feeling. Pleasantly surprised when we sat down and took the first bite. The honey mustard-based dressing really brought the greens and the crispy but moist chicken together, it was very flavorful. This is a wonderfully light and easy dinner to make, we had it on the table in 30 minutes. We don’t have kids but I imagine it would be very kid-friendly as well. Stephanie, thank you for picking a great recipe and for being our hostess for this month’s HHDD! Be sure to check out Stephanie’s site for the round-up of HHDD # 28 entries, I am sure there will be some great dishes from some fantastic cooks! To make the dressing, place the mustard, lemon juice, garlic, oil, honey, salt & pepper in a bowl & whisk to combine. Set aside. Combine the parmesan and polenta together in a shallow bowl. Brush the corn with oil, place in a baking dish & roast for 25 minutes or until golden. Slice the kernels from the corn & set aside. Slice the chicken in half horizontally, dust with the flour, dip into the egg & press into the combined parmesan & polenta to coat. Heat the oil in a non-stick frying pan over medium heat & cook the chicken for 2-3 minutes each side or until golden & cooked through. 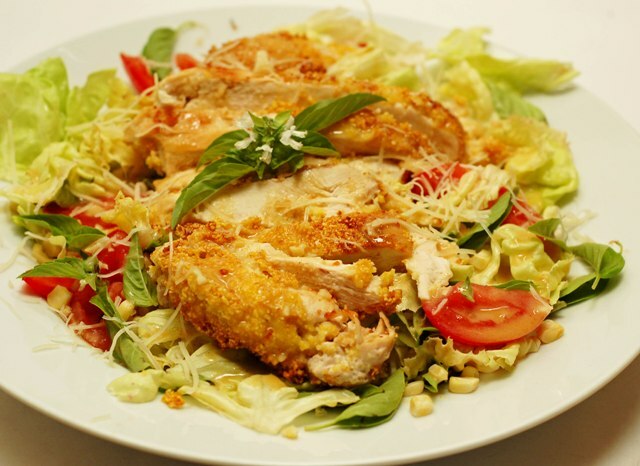 Arrange the chicken, corn, spinach & basil on plates & spoon over the dressing & grated parmesan to serve. Serve. One Response to "Polenta and Parmesan Chicken"
Mmmmmm- perfect for a family-friendly dinner! Look forward to meeting you this weekend! !